Emerald cut diamonds have one of the oldest cut patterns of all diamond cuts. Although it is now possible for cutters to create more complicated cut designs like the Princess cut, the emerald cut is still in demand for its clean lines and classic style. The most recognised form of emerald cut, as shown here, will have a greater length than width. In the jewellery trade, we refer to this as its ratio. This length and width can vary from diamond to diamond, giving quite a variation to the way emerald cut diamonds look. Some shorter diamonds start to resemble the Asscher cut diamond, while longer, thinner diamonds can be quite baguette-like in appearance. Very careful selection is required for emerald cut diamonds, as their geometric cut requires precision to look good. This cut type is very visually unforgiving. Symmetry, rear facet angles and clarity are all critically important areas that will need particular attention. We often see poor shape and misalignment of facets in this type of diamond. These issues can be particularly commonplace in lower priced emerald cuts. This can be the case even if high grades seem to suggest a fantastic diamond that is well priced. Extreme care needs to be taken to make sure an odd shaped diamond is not the end result. It is also often easy to see inclusions within a diamond of this type. With fewer facets the clarity grade should not be too low. Generally we would suggest not less than a VS2 grade in clarity for an emerald cut. An emerald cut diamond with similar proportions to the one shown in the photo here will reach 6.5 x 5 mm. This size will have a weight of a little over 1.00 ct. 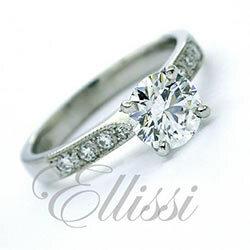 This is a perfect size for a number of Ellissi Emerald Cut Diamond Rings. The Best Emerald Cut diamonds. The best emerald cut diamond can vary depending on your preferred shape. The image above shows a 0.75 D/VVS2 emerald cut, a GIA certified diamond. It is representative of all the good points to be hunted for emerald cut diamonds. Great symmetry, high colour and high clarity. These quality elements, when combined with “Excellent luster” all lead to a fantastic outcome. The only thing left to consider after that, is just how big for your budget you may be able to go.